The latest photo in need of a caption. Amanda Cohen, who took this last summer in Lancaster County, ended up with a little surprise while uploading it to her computer. Thanks to Emma for sending it along! Nah! Nah! Nah! We don’t have to worry about gas prices like you!! "Keep laughing all you tourist's"
They won’t find us here. Not competing for the caption, but Finding Raspberries from Beth is cute. What I like is the girl reading a book. That was me on long car trips. If we know the Amish take offense to our taking picture, then why do we take them? I’m a little confused. I agree. I have many pictures of Amish things, but not one picture of an Amish person. Hi Letty – When we’ve been in Amish country, an Amish woman said we could take as many pictures as we wanted, just not to ask them to pose for a picture. I asked what about taking a picture of someone plowing a field or working in the garden and she said that was fine. I asked if she had any pictures of her own children when they were small and she said, “Oh maybe a couple.” I wouldn’t get in someone’s face (Amish or not) but from afar, I don’t think they really mind. I just want to say that we were very far away when my friend took this picture. In fact, the original picture wasn’t up close like this, she enhanced it on her computer. I don’t usually take pics of the Amish and I tell my friends all the time not to. 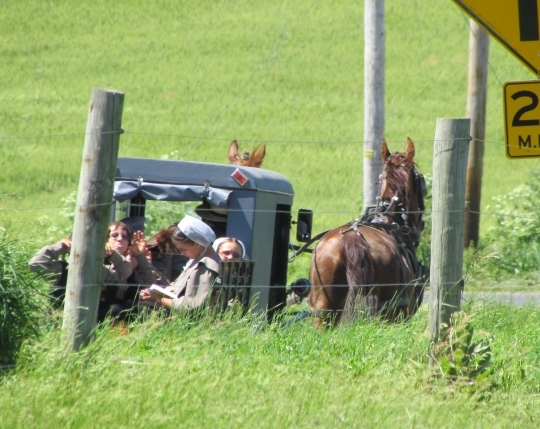 However, I’m not so sure that taking pictures from far away is something that bothers the Amish, I think it’s when you get up in their faces and go about it rudely. This picture was not taken to offend the Amish, I can assure you that. I would agree that few people would take a picture of an Amish to offend them, but just because you have a long lens or enhance it on a computer does not make it RIGHT. Many years ago I asked a friend if he would mind having his picture taken from the back. He said he didn’t think he would like that, end of conversation. Bill Coleman’s pictures are beautiful, but I don’t understand how he takes them. My Amish friends are very conservative. Good points Tom and food for thought. I wouldn’t be surprised if you got that answer. Some people do care, and don’t want any photos, some don’t care, some don’t care if it’s taken from far away, some don’t care if it’s the kids, some Amish give TV news interviews and appear in PBS films, and so on. I know that doesn’t mean everyone is okay with photos of children, and maybe it’s best never to take/post any photos of Amish people at all…I don’t get too hung up about it especially in cases like this as these kids are having fun with it…probably not for the first time in Lancaster Co.
My grandparents on both sides were Amish. There were some photos taken taken. Some looked as if they posed for them.I treasure the few that were taken. I understand that, Tom and trust me I would never do it myself. My friend was basically hiding behind a group of us in order to take this picture. I’m not saying it was right, but she wasn’t doing it so that they could see the camera. I’ve told a lot of my friends that I think it’s wrong, but they do it anyway. I would never do anything to offend the Amish…that’s not what this picture is about for me. I just thought it was cute! As I’ve read here, as well as other sources (books,especially those written by former Amish, Mennonites, friends of Amish) I know that picture taking restrictions vary from settlement to settlement, church district to church district. Some (like Schwartzentruber Amish) absolutely forbid it—they’re ultra conservative. Others (Beachy? other “New Order” Amish) allow it in a limited way. I’ve read that generally speaking, children can have photos taken of them—they’re not yet church members. Some allow “far-away” photos of adults (so their faces can’t be identified). I did professional photography for 27 years. You name it,I photographed it … with the exception of any of my Amish neighbors. There have been so many times I have seen the children doing some of the cutest things, yet, out of due respect, I have never taken a picture of any of them, and never will. Any chance that young lady is giving those boys a good “preaching to” and that is their response to her? I found your comments interesting. Not all Amish are the same and that is the case with photos. Thank you have a wonderful Easter. I am on a self-imposed hiatus, but I had to come back for a caption contest. Can’t resist. S’up Erik, all I talked about since the end of March and beginning of April was cabbage rolls (rice v meat), kielbasa and perogies with the people I’ve met. Speaking of Amish and pictures, there was a four-episode little series about a veterinarian who’s been practicing in, I believe, Michigan for 50 years or so, and on at least two episodes he was shown visiting Amish farms, and in one case the farmer appeared on camera and in the other one of the farmer’s sons did, and in neither case was there any apparent objection. I found it quite interesting since like the rest of you, I’ve always understood that most Amish don’t want to be in photos, let alone on a TV show. My Amish neighbors are a Swiss group. They are very strict in some ways, not so much in other ways. As someone above said, every group of Amish is different. I totally agree with Sara, the same with my Amish friends and neighbors. A couple weeks ago,I was over watching the children play as their dad was plowing the garden with horses. His wife was standing next to me, and a car slowed down on the road, and she made a comment, “I know they were taking a picture, and it just makes me so angry, when they know better”. There seems to be quite a bit of variation in picture-taking beliefs in different communities and even in different families. My Amish grandmother in Indiana used to say, “You can take my picture; just don’t make me pose.” My Amish sister in another state says, “You can take pictures of the children, but not of me.” We have other Amish relatives we would not dare to take a picture of. Looking back at an elementary public school yearbook, some of the Amish children were pictured, and others had a blank space beside their name. This “fun stuff” photo became a rather serious topic! I thought it might have the potential for that Yoder 🙂 Has been very interesting reading the varied responses. The Amish are very good teachers. I wish I could help work for them. The children in the picture are “hamming it up” much like anyone else’s children. When it comes to the Amish and pictures, there are many reactions. Being much like you and me, they enjoy looking at pictures of their peers. Visiting with my brother who is Amish, he pulled out one of those Amish picture calendars by Doyle Yoder and asked me if I could pick him out in a barn-raising photo. Which I then did. You may think they would all be offended by the photos, but they will buy the calendar for the photos, and then not hang it up. The same thing applies in magazine photos. Offended people would not cluster around to see themselves in photos. Clearly they enjoy those great pictures of themselves, but not on an official level. Those calendar pictures were taken without permission, but they enjoy them anyway. It may seem strange, but if the picture was unposed and taken without permission, then no one will face discipline. Ask permission and it will be denied, because in most cases answering “yes” would cause trouble. Know your way around the system and no one will be offended. If in doubt, refrain. Wow!!! All the responses. You all are great. I have an Amish friend in Kentucky that I so badly wanted to take a picture of , and her ten children, but when I asked — the answer was they would consider it rude because of their beliefs. THAT is why I was so confused. She is such a great friend I would never try to do anything that may offend her. She is so much fun to be around. Maybe she was just giving me the “expected” answer. I plan to ask her when we are alone–after explaining why I am asking to begin with. We are constantly writing letters back and forth, and I could ask her in writing. However, all of her family shares my letters, so I’ll wait till I can spend our alone time together. This is a time we set aside and let each other ask any questions we’d like without taking offense. I have such a great time with her and her family. If only I could get the courage to ask to stay with her for a month or two to learn some of their ways of living. I mean I’m such a city girl who now lives on a very small acreage (2 acres in Oklahoma) and have recently bought chickens because they were so cute in a local hardware store. Ha, I don’t even know the first thing about raising chickens. Plus they all now have names, so I can’t eat them. My Amish friend, Mary, would just laugh if she saw me with my chickens. Thanks to all for you for all your responses.